The Osprey Aether 60 is a dependable, solid backpack that is still comfortable to wear even for heavier loads. If you love hiking light and fast, then the Aether is the way to go. While one of the lighter hiking packs we tested, it has a lot to offer in the way of shoulder strap comfort and waist belt comfort. It’s also designed with total adjustability in mind, making it perfect for a variety of applications. We did run into some issues with the lack of support with the suspension. It has plenty of other great features to offer including a large kangaroo stretchy pocket, well-designed shoulder straps, compression straps and easy to grab pockets for your water bottles. Overall, this pack was a pleasure to use and it’s one that will come in handy on whatever type of adventure you choose next. The problem some people have with Osprey is the price, which is a little steep, but with a higher price comes a lot of quality, unique design features and plenty of versatility. While marketed as a hiking backpack, this pack can do so much more and will be your go-to pack for any type of camping trip or outdoor adventure you go on, for years to come. This type of versatility is what keeps Osprey at the top of its class. We liked the articulation and shape of the shoulder straps, and the type of foam the manufacturer uses. The waist belt is supportive and comfortable without being too bulky. While many minimalist or frameless packs tend to be lighter, this model is one of the lighter fully equipped packs on the market. But it’s definitely not an ultra-light pack, although you can save a few pounds without having to give up any comfort items. The Osprey compression system is pretty cool. With a traditional pack, the compression straps usually crunch the sides, but this model compresses from the back, which works to evenly flatten out the entire pack. The straps go all the way across from the pack, working to shrink it small enough to make it ideal for use as a daypack or summit pack. We also liked the two stretchy water bottle pockets that make it easy to quickly access water. Located on the back of the pack you’ll find a larger stretchy pocket, which is the perfect place to dry any wet clothing, or you can use it as a secure place to store smaller items. The removable lid is a nice feature and it can be worn as a fanny pack for shorter hikes. The shoulder straps are impressively easy to adjust, thanks to the large Velcro pad that slides up and down, giving you the ability to tweak the straps to the millimeter for a perfect fit. Pros: Many hikers can agree that this Osprey pack is a jack of all trades. Highly versatile, this is a good pack to use on almost any type of multi-day ski touring or hiking trip. It excels at trekking, mountaineering, and backpacking because of its volume and comfortable straps. While relatively slim, the frame offers a lot of flex that will allow it to move with your body. This makes the Aether a good option for Alpine climbing or ski touring. You can carry around seven or eight days’ worth of supplies in this pack, but if you’re especially good at packing you could easily stuff enough gear in it to last you five more days. This model will excel for backpackers and climbers who can manage to keep their load under forty pounds. This backpack is available in six colors including bonsai green, midnight blue, arroyo red, Adirondack green, outback orange, and Neptune blue. Cons: The waist belt and shoulder straps are fairly comfortable, compared to other packs in this price range, but the suspension was somewhat lacking in supportiveness. When the backpack is about half full, you probably won’t notice any issues, but at about forty pounds in, you’ll notice a big difference. We also didn’t love the lower straps, which are too short and didn’t work well for attaching sleeping pads. While they aren’t very long, we did like the placement of two straps located over the sleeping bag storage compartment. If the manufacturer is going to place them there, they should at least be about six inches longer. This model comes with slightly more features than older versions of the same pack, however, the older versions were about a pound lighter. 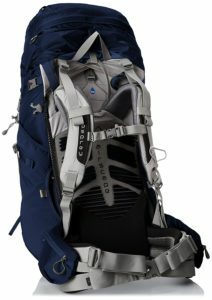 Many hikers felt that the pack had plenty of storage and pockets, but it doesn’t have quite as many as its competitors. The attached gear loops are placed back too far to be of any use for climbing. It seems a poor place to put a water bottle, especially when you already have a couple of water bottle pockets. We also aren’t sure about the quality of the nylon used, it just doesn’t seem thick enough. The Teton Sports Mountain Adventurer hiking backpack has an excellent reputation for durability and may be a better option for longer trips. While the waist belt is heat moldable, most hikers didn’t find this necessary as it won’t offer any more comfort than breaking in the pack by wearing it would. Unfortunately, this pack doesn’t come with a rain cover, so you’ll have to purchase one separately if you plan on camping out during the rainy season. As we mentioned earlier, this is one versatile pack. You can use it for any length of trip, in most types of weather. We love the ability to fine-tune the fit of the straps, which is what makes this pack truly shine in our book. While the suspension is somewhat lacking, if your pack weighs under forty pounds you should have no problem. Hikers who purchased the Osprey Aether 60 hiking backpack gave it a rating of four and a half stars out of five stars for durability, versatility, and ease of use.